Juicy Couture Viva La Juicy is a tantalizing, teasing and tempting perfume that provokes the senses and soul. Juicy Couture Viva La Juicy has been created for those who cannot get enough couture! 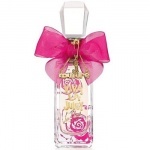 Juicy Couture Viva La Juicy is for Juicy girls who want it all. Juicy Couture Viva La Juicy enticing scent of wild berries and mandarins, honeysuckle, gardenia, and jasmine. This is heavily layered over a warm amber, caramel, vanilla, sandalwood, and praline heart that adds just the right touch of sweetness and that unusual and fashionable Juicy Couture charm.